Depth control is an intricate part of the circuit board drilling process. When aspect ratios are pushed to the limit, depth penetration becomes extremely critical. If not maintained properly, tool costs will skyrocket along with drilled scrap. Checking the depth penetration with a quality depth gauge on a scheduled basis is highly important. Circuit board holes are created using mechanical or laser drilling processes to connect the copper layers. Many holes go completely through the circuit board into the backup material. 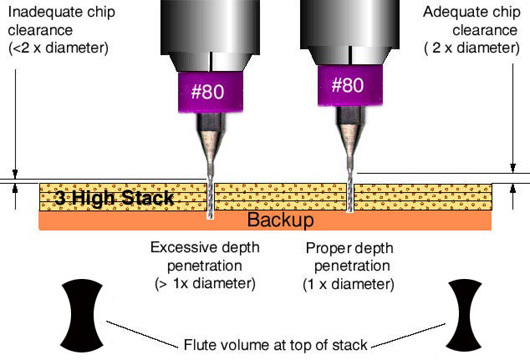 A depth gauge is used to control the drilled depth into the backup in order to maintain sufficient flute clearance at the top for chip removal. Some circuit boards require holes that do not pass all the way through the entire board. These holes are called blind vias when they connect an internal copper layer to an outer layer, or buried vias when they connect two or more internal copper layers and no outer layers. It is critical to check the hole depth regularly during this process to prevent excessive drill though, leading to defects and rework, or scrap. Gauge your process and reduce your scrap. 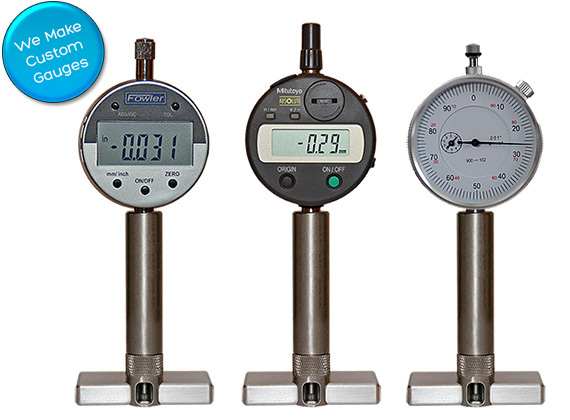 A digital or analog depth gauge is for very accurate measuring of hole depth up to .500″ in holes .008″ – .600″ dia. Used for checking drill depth in the manufacturing of circuit boards and many other applications in the PCB, aerospace and medical industries. Standard pins are .008″ – .026″ dia. Other sizes available upon request. Click the Pin Request button on the sidebar to specify your custom pin requirements. Circuit board manufacturers worldwide have been using our gauges successfully to assure uniform and consistent drill depth throughout their processes. Contact us for a custom quote. If you are drilling circuit boards or have a custom application that requires depth gauge checking, we can develop a custom measurement tool to help you control your process. NOTE: The base block is an additional option on all gauges. We utilize a unique patent pending base with a convenient viewing window that was created specifically for operator ease of use. This feature also dramatically reduces the occurrence of bent pins. All gauges come with a black delrin cap to protect the pin from breakage while not in use. © Copyright 2019 – Multi-Tech Resources, LLC.